Plastics are versatile and flexible materials and they may be very suitable for use in your project. This may be an area of materials research that you need to investigate in detail. It is important that you read the information below and consider the type of plastic that will best suit your project. All plastics are based on polymers and they are created by bonding molecules together. The terms monomer and polymer are very important in the plastics industry. A monomer is a relatively small molecule that can chemically bond to other monomers, forming a polymer. Remember, all plastics are polymers. 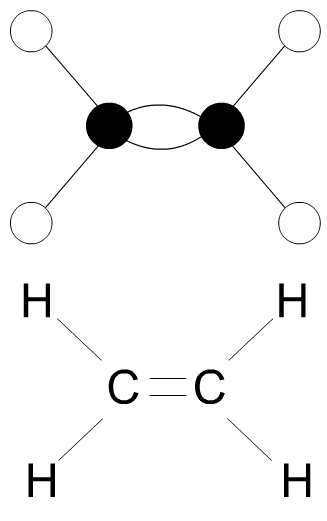 Example - derived from oil - a hydrocarbon ethylene molecule(seen opposite). Many modern plastics are manufactured from oil. An ethylene monomer forms a’ long chain monomer’ due to individual ethylene monomers joining together. This produces the polymer - polyethylene. This is a thermoplastic and is useful in the manufacture of 'plastic' bottles. Once 'set' these plastics cannot be reheated to soften, shape and mould. The molecules of these plastics are cross linked in three dimensions and this is why they cannot be reshaped or recycled. The bond between the molecules is very strong. These plastics can be re-heated and therefore shaped in various ways. They become mouldable after reheating as they do not undergo significant chemical change. Reheating and shaping can be repeated. The bond between the molecules is weak and become weaker when reheated, allowing reshaping. Thermoplastics tend to be composed of 'long chain monomers'. These types of plastics can be recycled. Many adhesives (glues) are thermosetting plastics. 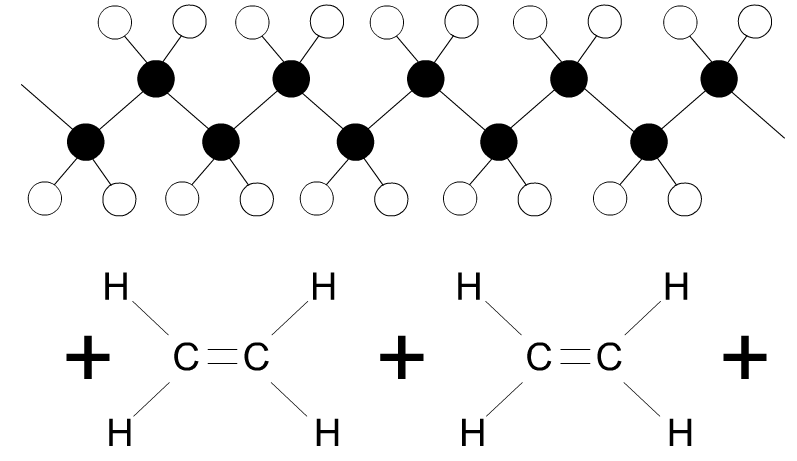 A good example is ‘Araldite’ which is an epoxy resin that hardens when a second chemical is added (a catalyst). It will bond most materials including woods and metals as well as some plastics. Polyurethane. This forms the basis of many paints and varnishes because it is very tough and has water resistant qualities. Melamine Formaldehyde. Used in the production of plastic laminates because of its smooth surface and hygienic qualities. It is also used in electrical plugs and sockets because it can be cast and it is an excellent insulator. Urea Formaldehyde (UF): Urea Formaldehyde has physical properties of high hardness and high toughness, making it suitable for strong, knock-resistant electrical fittings. It is also scratch resistant and a very good electrical insulator, making electrical fittings manufactured from this polymer safe to use. Polyester resins. If resins are combined with a material such as fibre glass the result is a very tough material that can resist impact. This type of material is known as a glass reinforced plastic (GRP) and is used in car body repairs, sailing boats, corrugated sheet because of its lightness, toughness and resistance to water. These plastics possess a common property, they soften when heated and are often used in schools to vacuum form shapes. Usually, when heated and formed into a shape - if reheated they return to their original shape. Acrylic. (PERSPEX® Lucite International's acrylic sheets) This is the most common plastic in a school workshop. It is purchased usually in the form of sheets and comes in a range of colours. It can be translucent (e.g. smoked), transparent or opaque. It is resistant to most acids and weather conditions. Please note, the brand name Perspex®, is owned by Lucite International (http://perspex.com/). Polythene. Can be moulded into almost any form due to its excellent moulding qualities. Used for the production of bottles, bowls, toys, tube etc... It is available in large sheets. There are two types: High density which is rigid and hard, and low density which is tough and flexible. Machine parts are generally made from high density polystyrene whilst bottles are made from the low density polystyrene. Polyvinyl Chloride. Better known as PVC. It is a tough material which can be purchased as a hard material or alternatively a flexible form. It can be welded or bonded with an adhesive. It has a range of uses including water pipes, raincoats, long play records, coating on electrical wires and many more. Polyethylene. The most common plastic in everyday life. Used in the manufacture of 'plastic' bottles, grocery bags, shampoo bottles and children's toys. Polycarbonate. This is a thermoplastic which means it can be shaped and formed through a number of manufacturing processes. It machines well and can be solvent bonded and welded. It is tough and resistant to damage which is an ideal property for a mobile phone. If dropped, a mobile phone with a polycarbonate casing is likely to survive undamaged. It is an insulator, often used to insulate electrical circuits.It is supplied in a range of colours. Styrofoam. This is a light-weight dense foam. It is easy to shape with saws, files and abrasive paper and is ideal as a model making material. Expanded Polystyrene. An efficient insulator used in cavity walls and as decorative tiles and covering on ceilings. It can also be used for basic model making. Nylon. Is used in engineering to make gears and bearings. It’s oily nature means that friction is reduced between moving parts made from nylon.